Be the first to share your favorite memory, photo or story of NORAH. This memorial page is dedicated for family, friends and future generations to celebrate the life of their loved one. 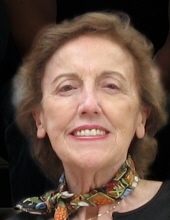 NORAH STUHLDREHER (nee Burran) of Lakewood, Ohio died peacefully on March 22, 2019. She was the loving wife of the late George W. Stuhldreher; devoted step-mother of Karen Stuhldreher (John Calcagno) and Diane Jerdan (David Mulveny); caring grandmother of Riley Calcagno and Kyle and Trevor Jerdan; sister of Mary Minnis, and the late Colin, Eric, and Michael Burran; dear aunt of Tony Minnis, as well as many nieces and nephews in the United States and England. Norah was born in London, England on July 3, 1929. The family wishes to thank the caring staff at Ennis Court, Lakewood, Ohio. Funeral Service is at 12 NOON SATURDAY, APRIL 20 at McGORRAY-HANNA FUNERAL HOME OF LAKEWOOD, 14133 DETROIT AVENUE where the family will receive guests beginning at 11 AM. Interment following at Lakewood Park Cemetery. The family suggests donations to the Cleveland Sight Center, 1909 East 101st Street, Cleveland, OH 44106. clevelandsightcenter.org. "Email Address" would like to share the life celebration of NORAH STUHLDREHER. Click on the "link" to go to share a favorite memory or leave a condolence message for the family.